by Paul Jacob, Contributing Author: Consumer sovereignty is the idea that in markets consumers call the shots. In capitalism, most mass production is indeed for the masses, and the masses have a big say in what gets done. All profits and wages of successful businesses come from conumers. But don't take this too far. Consumers don't "create jobs," for example. Recently, Clinton-era Labor Secretary Robert Reich has been floating this bizarre notion. To his Facebook audience, last month, he wrote that it is a myth that "the 'job creators' are CEOs, corporations, and the rich, whose taxes must be low in order to induce them to create more jobs. 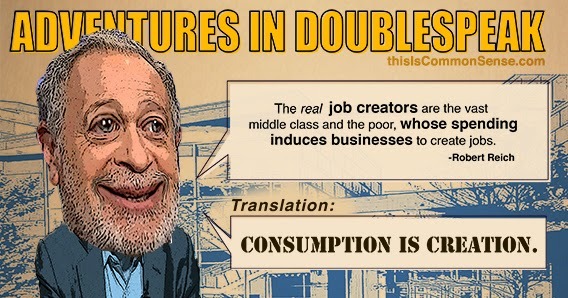 consumers who "create jobs"? And they do this by "inducing" businesses to, wait, uh, "create jobs"? Face it: businesses create jobs - out of capital from somebody's invested savings. Entrepreneurs brace themselves to take big risks, fronting workers' wages as well as hiring and purchasing capital goods and material. Before a penny is spent by consumers. Only when entrepreneurs guess right does the flow of money come full circle. Reich repeated his quasi-Keynesian rap: it's spending consumers who "get businesses to expand and hire." Truth is, Reich doesn't "get" basic economics. But he does understand political equations, which is why folks on the Democratic left think he's a genius. Tags: Paul Jacob, Common Sense, Robert Reich, Mythed Up, quais-Keynesian, consumption equals creation To share or post to your site, click on "Post Link". Please mention / link to the ARRA News Service. and "Like" Facebook Page - Thanks!